The large, well-preserved Meitner multiring impact basin is revealed through the dense opaque atmosphere of Venus by the imaging radar system of Magellan spacecraft. Meitner, the third-largest impact feature identified on Venus, shows a flat smooth (dark) interior, two rugged circular rings, and a rough (bright), irregular deposit of lobate ejecta. 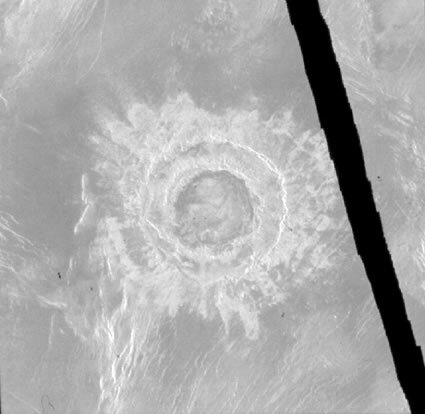 The crater was formed on smooth volcanic plains cut, prior to impact, by abundant parallel northeast-trending fractures. Radar image data were not acquired over the linear zone running through the eastern portion of this image mosaic.